Parrot's AR.Drone is a product we've covered in the past, even before its app was available for Android. We liked it that much. The idea is this: a remote-controlled, camera-equipped quadricopter - and your Android phone is the remote (via the AR.Drone's built-in WiFi transmitter). Just look at this thing. I will call him Iago. I know you're already excited. So was I. In fact, actually using the Parrot is (mostly) an absolute blast. I would play with this thing for hours... if I could. The AR.Drone is smart. It auto-stabilizes, locks its position if you lose WiFi connectivity, and the propellers automatically cut out when you (inevitably) crash. Its foam frame and plastic rotors are nice, soft, and flexible - meaning you'll have to take a pretty mean (and intentional) spill to cause the Parrot serious damage. And when you do break something, Parrot's got you covered with a gamut of repair parts and tools available online. These are all very good things. 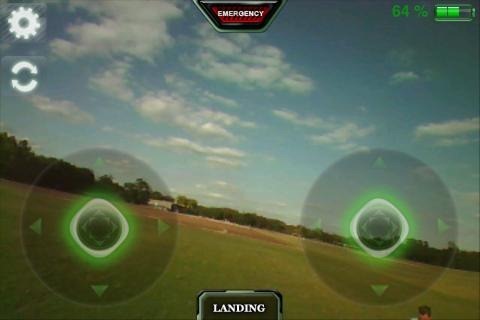 The app (AR.FreeFlight) which controls the AR.Drone is an impressive feat in and of itself. The number of customizable settings (some of which I don't even fully understand) really shows how much more you can do with a software interface compared to knobs and switches on a plastic box. The app conveys video at a reliable speed, and has yet to cause me any real problems. But it isn't perfect, so I'll talk about that in a little more detail in a bit. 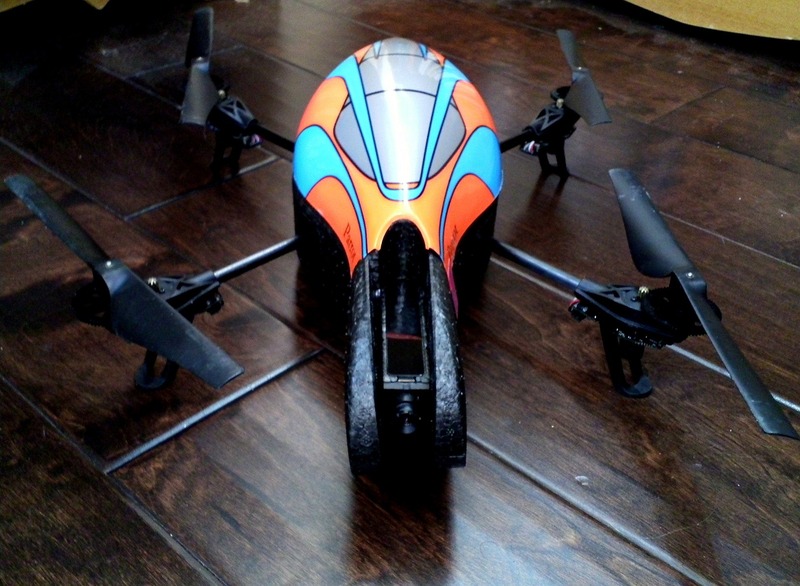 So, just how easy is it to get your Parrot AR.Drone up and running? Surprisingly simple, actually. Charge the battery with the included charger, pop it into the Drone's uncovered chassis, and then put on either the indoor (I suggest starting with this) or outdoor body frames. 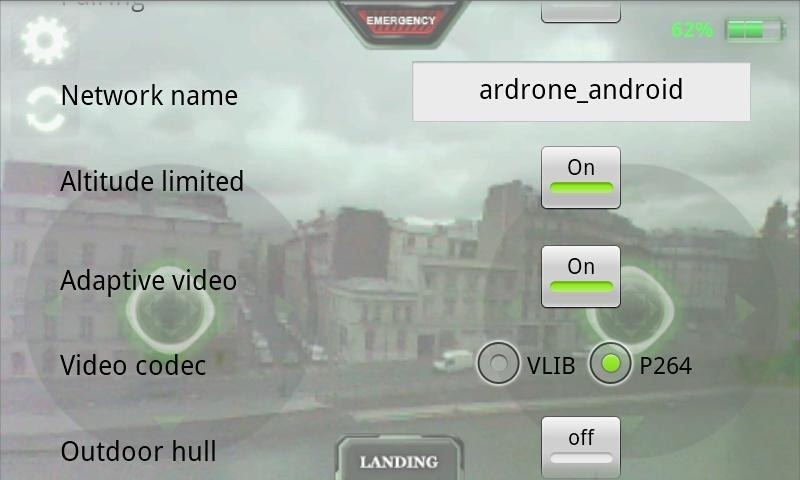 Then, download the AR.FreeFlight app on your Android phone (it's free in the Market). Next, connect your phone to the AR.Drone WiFi network, which should be open (you can pair the Drone with your phone specifically to keep curious WiFi scavengers out). Finally, launch the AR.FreeFlight app. At this point, the app will connect to your Drone, and once the camera starts transmitting, you're set for takeoff. Almost. OK, so if you're a Drone owner, you probably already know this, but there's more than one alternate AR.Drone controller app out there for Android. And some of them review better than the stock app (see AR.Pro) So, really, the only thing that's new about the Drone is the fact that Parrot has finally released its official controller app for Android. While using the AR.FreeFlight app, there are two rather important things I learned. First, immediately check the "Disable Accelero" option in settings. Controlling the Drone via your accelerometer (holding down on a circular area on your screen activates the accelerometer) is probably a lot like being a smooth-talking airline pilot in the 1960's: namely, drunk. Using the accelerometer controls in your home with the Drone is asking for a Qantas-grade catastrophe - by that I mean you're probably going to end up breaking something expensive. Second, keep this thing outside. Basically, using the Drone indoors is a lot like releasing a live eagle in your living room, minus the bird poop and razor-sharp talons. Things will get knocked over, and small animals will flee in terror. In fact, even with the accelerometer controls disabled in favor of a traditional joystick, I never felt comfortable enough to use the Drone indoors after my first attempt to do so. 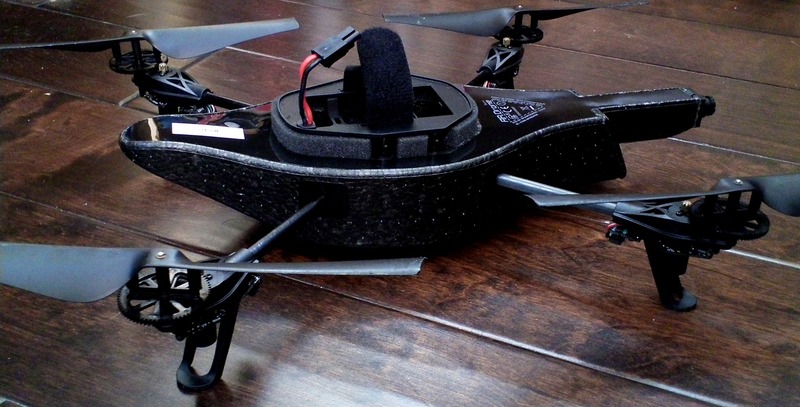 If you have any breakables anywhere near where you're planning to fly the Drone, move them. Because you will, inevitably, hit something. Hanging light fixtures? Avoid at all costs. Standing lamps? Those will have to go. Small children? Let's just say those propellers are spinning pretty fast. I always felt that the controls of the AR.FreeFlight app were just imprecise enough to make me feel like I was never in total control of the Drone, a feeling RF control transmitters are decidedly better at eliminating. WiFi connectivity has gotten great at reducing latency between devices, but honestly, it still feels a little, mushy, to me. If that makes sense. That's not to say it's bad. Once you're in the great outdoors (keep the number of trees, thorny bushes, and unavoidable bodies of water to a minimum), flying the AR.Drone is so much fun that you'll forget all about that $70 vase you knocked over and the cat's newfound hatred towards you. If you have someone else to fly with (I didn't, which made me sad), I imagine it's twice the fun. Just avoid really windy days - you'll spend the whole time fighting the gusts, and you'll probably crash a lot. Relatedly, it's best to learn how to fly the Drone in a public park with lots of nice, soft grass. But in good conditions, the Drone is so much fun to fly that it's intoxicating - you'll feel 12 again. Remember that awesome R/C chopper you wanted as a kid but that your parents wouldn't let you get so you got one of these pieces of crap instead? Well, guess who's got the credit card now. You can bank hard corners, fly it to crazy heights, and nosedive in ace pilot fashion just before pulling up and saving yourself from sure destruction. It's not quite as precise and easy to control as this promo video might have you think, but with practice, I imagine you can get pretty good with the Drone. Now, let's move onto the Drone itself (as opposed to using it). Like I said, the design of the AR.Drone is pretty awesome. Four propellers are powered by an electric motor, each electronically controlled to auto-correct the Parrot's angle of attack and pitch, yaw, etc. - basically, the Parrot's firmware does all the stuff that makes flying a real RC helicopter extraordinarily difficult without any assistance from you and independent of any reliance on the app. And that's good, otherwise you'd be crashing it all the time. The Drone is extraordinarily light. That's because its external structure, and both of its body frames, are made of styrofoam. It's then fitting to think of the AR.Drone's indoor frame like a bicycle helmet - it's great for learning, but you look so much cooler without it. Now, if you do use the Drone indoors, please, for the sake of your worldly possessions and the safety of others, put on the indoor frame. Once you've got the hang of the Drone outside, slap on the bumper-less outdoor frame and the Drone becomes faster and more agile due to the reduced wind resistance and weight. The frames absorb most damage pretty well (I crashed it enough to know this, sadly), though my outdoor frame was slightly cracked on the shell and had torn completely through at the narrowest point (it's soft, flexible styrofoam) after five or six flights - so, 10 or 15 crashes. Most of those were before I turned off the accelerometer controls. The Drone itself seems sturdily built, as I can personally attest to. On the final flight of the Drone, I accidentally crashed into a pool when one of the rotors lost power and the chopper plummeted towards what I thought would be a watery grave. 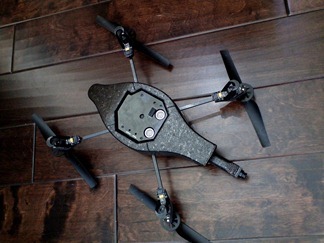 After letting the Drone dry out, it's almost completely functional, though the rotor which lost power no longer spins. This could be totally unrelated to the dip in the pool, and seems to me the likeliest explanation for the crash. Before that crash, that rotor had been somewhat wobbly - it seems likely it was damaged in one of my earlier, harder crashes. If you go to Parrot's shopping website, you can buy all the parts to fix a problem like this yourself. It's not incredibly cheap, but at least you can fix it. They even have mending tape to fix the torn body shell issue I described. OK, this is where the AR.Drone loses all of its points. Battery life, without a further ado, is: 12 minutes. Yep. That is the manufacturer stated battery life, which means in optimal conditions. 12 minutes. And that's not even what you'll get - the first couple times I flew the Drone, I thought there must have been something wrong with my battery. I got maybe 7-10 minutes. I thought that it was defective, or overused, or broken. Nope. That's normal. In fact, the problem is so bad you'll find the web is full of juice-extending modifications for the Parrot that will void any glimmer of a warranty you have. Some have resorted to higher voltage, heavier batteries, cutting out space for bigger cells and running on overvoltage - causing the Drone to increase altitude constantly, as well as making it extremely difficult to control. Parrot's recommended solution? Buy more of our batteries. 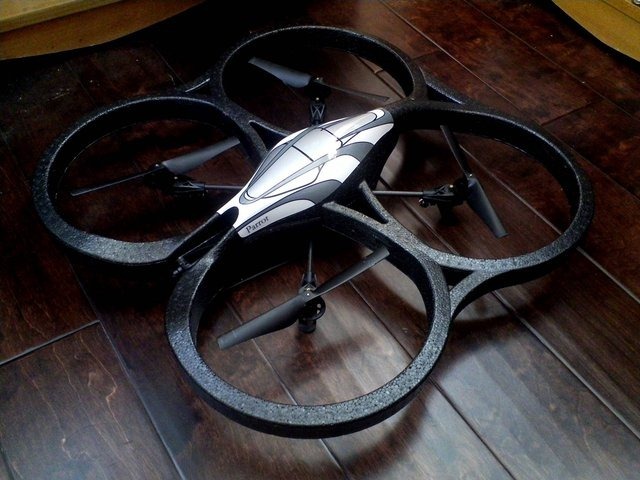 The AR.Drone can already fly independently for 12 minutes, powered by the battery supplied when you bought it. You can increase this time using the additional batteries available here. The batteries are $30 apiece, which isn't a terribly large investment considering the Drone's entry fee of $300. 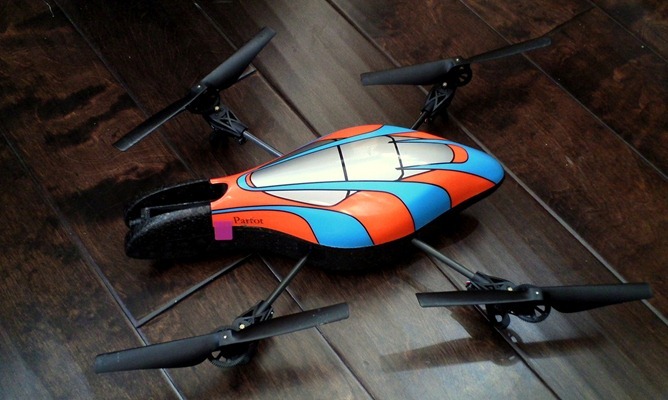 With 2 additional batteries, you'd be able to get a good 30 minutes of flight time in. But consider this - you'd then have to charge those batteries, switching them out religiously every hour and a half (that's how long it takes to charge each one) to ensure you'd have all three for your next flight. Parrot should, at least, supply this thing with 2 batteries standard, and preferably with a charger which can juice up two batteries at once. If the Drone was a $100 toy, I could understand, but it's clearly a sophisticated piece of equipment with a fair share of electronics on board designed to do all sorts of awesome stuff. The battery life, for me, is a total deal breaker. I could understand 30 minutes, maybe even 20 - but when 10 is at the top end of the observed norm, I can't help but feel like this chopper would spend most of its time 6 feet off the ground. On a shelf.